U.S. stocks ended mostly lower on Friday, slightly paring strong weekly gains as investors largely shook off disappointment over a weak September payrolls report that was distorted by the effects of the two major hurricanes at the beginning of the month. Non-farm payrolls fell by 33,000 last month, their first monthly contraction in seven years, widely missing forecasts for an 80,000 increase. Wall Street instead focused on a stronger-than-expected rise in average hourly earnings, up 0.5%, topping projections for a 0.3% rise. Also positive, the unemployment rate fell from 4.4% to 4.2%, while the labor force participation rate expanded to 63.1 from 62.9 in August. The S&P 500 and the Dow Industrials snapped their multi-session winning streaks, while the NASDAQ Composite ended the week at another record high, its 55th of this year. For the week, the S&P 500 rose +1.25%, the Dow Industrials advanced +1.65% and the MSCI EAFE (developed international) dropped -0.06%. U.S. equity markets have traded higher since the 2016 presidential election amid several positive fundamental forces, including healthy economic data and robust earnings. Immediately after the election, however, another force drove equity markets higher — the prospect of corporate tax reform. While reform-related enthusiasm retreated in the wake of Washington gridlock, it has recently resurfaced, and is impacting returns in a similar way. 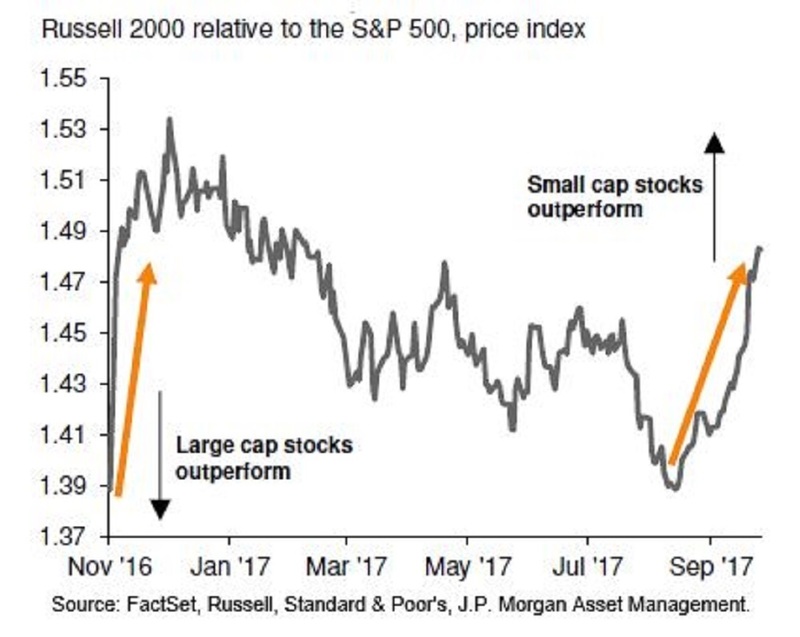 As Chart 1 illustrates, small cap U.S. equities outperformed large cap U.S. equities both immediately after the election and in recent weeks, thanks largely to the fact that small cap companies tend to have a higher effective tax rate than their large cap peers, and thus stand to benefit more from corporate tax reform. According to the firm S&P Dow Jones, companies in the S&P 500 paid out 25.6% of 2016 calendar-year revenues in taxes, well below the 35% stated marginal tax rate. But until tax reform becomes reality, investors should remember that the U.S. equity market may still perform on fundamentals alone. J.P. Morgan offers as evidence on this point that the S&P 500 returned 14.24% through the first three quarters on a total return basis. And with real second quarter 2017 GDP growth at an annualized rate of 3.1% – the fastest pace since the first quarter of 2015 – and continued corporate earnings growth projected by Standard & Poor’s, equities may continue to climb higher going forward, even without corporate tax reform.